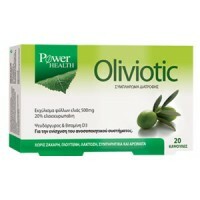 Synergistic food supplement with precious olive leaf extract, vitamin D3 and zinc! Olive is a gift from nature, and for centuries has been an ally offering its unique benefits. It thrives in the Mediterranean countries and is fully utilized. Olive leaves give oleuropein, a polyphenolic nutrient, as well as a mixture of compounds with the main constituents hydroxytyrosol and elenolic acid. The latter are readily absorbable and bioavailable in the body. These compounds mainly give their biological effects to the olive leaf extract. Vitamin D3 and zinc, which contribute to the normal functioning of the immune system *.